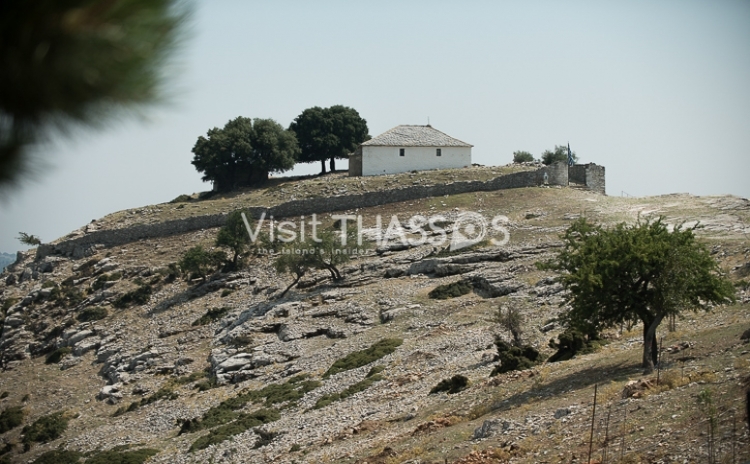 A few words about Kastro..
“Kastro” (Castle) is located on a top of mountain Ipsarion, northeast of Limenaria. It was named after the ruins of a castle that was found in the area. The fortification wall, its remains are obvious to this date, was built by Genoese, who ruled Thassos until its conquest by the Ottomans. It was abandoned when the residents moved to Limenaria to find work in the mines. To this date it has no permanent residents. In recent years some of the old houses are being restored by their owners to be used for their winter or summer getaways. In the square, in the centre of the village one can find the only cafe and the church of “Agios Athansios”. On the 18th of January when the Saint and the homonymous church celebrate, the village awakens. Residents, from all around the island, visit “Kastro” to participate in the week-long celebration introducing a quite unusual custom. Visitors are hosted at the houses of the village and wander from house to house drinking and singing for the Saint’s grace all night long. Gorges and ravines compose the rugged beauty of the scenery. Definitely visit this place! “Kastro” (Castle) is located on a top of mountain Ipsarion, northeast of Limenaria. It was named after the ruins of a castle that was found in the area.